Ubisoft’s VP of editorial, Tommy François, has admitted that the company has gone back to the drawing board with their two biggest franchises, Assassin’s Creed and Far Cry. Due to overhauling the creative aspects of both games in an attempt to create something groundbreaking and new, François has expressed reservations on either franchise having a release in 2017. “I’ll tell you what,” […] “We believe Alpha for these games needs to be one year before release. We’re trying to achieve that. That’s super f****** blunt, I don’t even know if I’m allowed to say this. This is the goal we’re going for: Alpha one year before, more quality, more polish. “So if this means biting the [bullet] and not having an Assassin’s game, or a Far Cry [in 2017], f*** it. While I might usually respond with a snarky quip and a smarmy reference, the reality is that I actually agree. Delaying the games so that they don’t end up rendering images like the one below should be Ubisoft’s top priority, and if that means moving the game out of a 2017 line-up, then that’s fine by me. “No, Far Cry’s only been going up in sales, so that’s not true […] We sometimes try to do too much – I’m actually super-happy. I know it’s perceived like [a marketing decision], and even if it is [perceived that way], it’s actually OK. Sorry but I’m going to have to call bullcrap on that. According to Steam Spy not only does Far Cry Primal not have very impressive sales (it’s actually lower than the poor-selling Battleborn) but both Far Cry 3 and Far Cry 4 are played more on a weekly basis than Far Cry Primal. Obviously one of those is not like the other. Far Cry 3 and Far Cry 3: Blood Dragon have the highest user scores out of the entire series (on PC) while Far Cry Primal has the lowest user score. If there was a way to measure the console sales for PS4 and Xbox One, I’m almost willing to bet things look similar. At least as far as Metacritic’s user scores are concerned it’s similar to PC, with the PS4 and Xbox One both sharing a user rank of 6.2 out of 10. 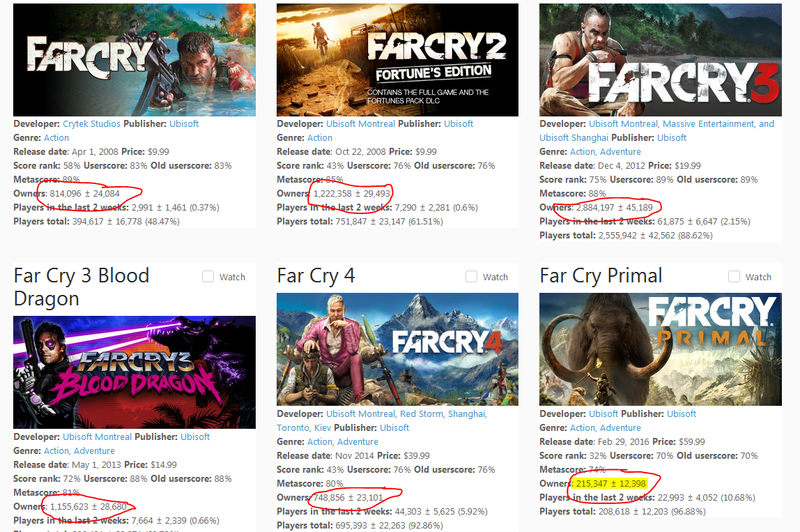 So realistically, Far Cry does not seem to be selling more nor does it seem to be resonating more with users. Just the opposite is happening. Assassin’s Creed is even worse off, with Assassin’s Creed: Syndicate being one of the worst selling mainline games in the series. Despite putting a stronger focus on a female lead and shaping the story around feminist-friendly talking points, it did not translate into higher sales compared to previous entries in the series. Nevertheless, rumors have circulated that the next game will take place in Egypt… a place traditionally not known for having gender equal traditions nor being particularly accepting toward females. I’m curious how they’re going to craft the narrative around the next game if they really are going with Egypt. Gamers have been frequently asking Ubisoft to take Assassin’s Creed to China or Japan as a mainline entry, but they’ve denied the fan requests, opting instead to experiment with places that people don’t really care about that much. Anyway, if they’re really overhauling the way both franchises can be played and offering more fun instead of grinding and quests designed to be chores, I just might take an interest in both games again. Something as fun as Blood Dragon would be nice for Far Cry, and a ninja-version of Assassin’s Creed could make it a day-one buy for me. In the meantime we have the Michael Fassbender Assassin’s Creed flick on the horizon, which is due in theaters this holiday season.